CELLAR DWELLER: An E.C. Comics Valentine To Cheap Thrills – Schlockmania! A genre flick doesn’t have to have amazing ideas or spectacle to charm the fans. Sometimes just love for the genre is enough to carry it through. Case in point: Cellar Dweller. This late ’80s quickie from the final days of Empire Pictures is the definition of a programmer, with the rough edges showing and a kind of hasty quality to how it is was made… but it was made by people who clearly love horror movies and that’s what gets it by as a fun time-killer. Cellar Dweller is about a cursed comic book. Its creator (Jeffrey Combs) used a magic text for his inspiration and he accidentally brought the comic book’s creature to life with an incantation, resulting in a fiery death for all involved. A few decades later, the house where this occurred is an artist’s colony where comics fan Whitney (Debrah Farentino) comes to bring the comic book back to life. Unfortunately, that very thing happens literally and she is soon trying to figure out to return the title creature back to hell as it bumps off the colony’s members. Make no mistake, Cellar Dweller is a fast, campy enterprise devoted to cheap thrills. The script, penned by a young pre-Child’s Play Don Mancini under a pseudonym, hits the expected monster movie beats but also throws in some fun satire of the art school world (there’s a great sendup of performance art) and a surprisingly grim coda. It’s also interesting to see a horror movie from this era with so many prominent roles for women. 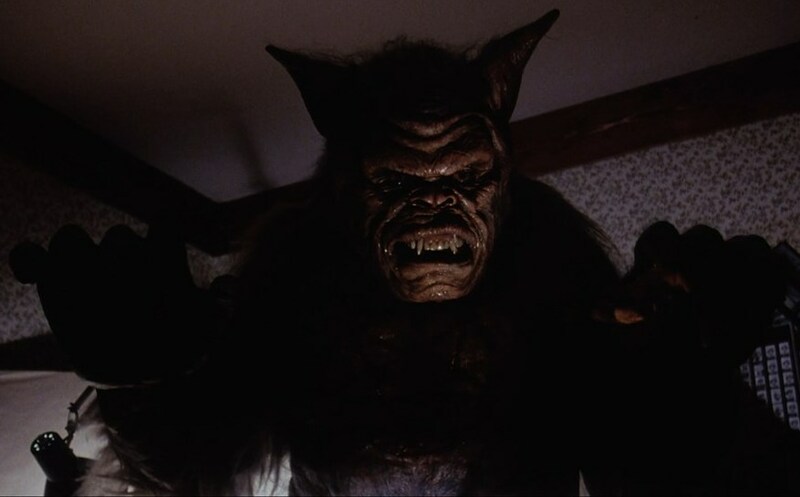 FX man-turned-director John Buechler maintains a breakneck pace, delivers a neat self-designed creature and has fun playing with how it bounces between the comic book and real life. He sometimes lets the comedy get too broad (Brian Robbins mugs shamelessly in each of his scenes) but overall manages a fun vibe reminiscent of a lighter Tales From The Crypt episode. There’s also good photography from Sergio Salvati, a regular of Empire’s Italian era, and a lead performance of surprising emotional depth from Farentino. Elsewhere, Yvonne De Carlo shows a nice dry wit as the colony’s headmistress and Vince Edwards has fun as an ex-cop turned hardboiled writer. In short, Cellar Dweller offers decent cheap thrills in a tidy running time (just under 80 minutes!). Even when its edges are rough, its trashy heart is always in the right place. Blu-Ray Notes: This title was recently released by Scream Factory as part of a double feature blu-ray with another Empire title, Catacombs. A title card before the feature warns that this was mastered from a film print from the MGM archives and that there might be some anomalies. However, outside of a bit of damage and one awkward splice, it looks pretty sharp and colorful for something not sourced from a negative. The 2.0 DTS soundtrack is similarly decent. No extras are included but you do get a bonus film in Catacombs.